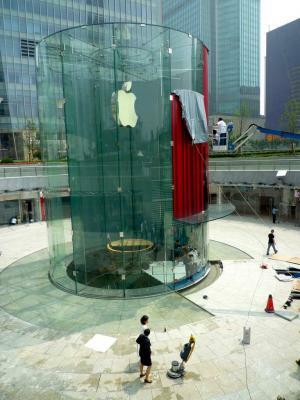 As noted by ifoAppleStore earlier today, Apple has begun removing the wraps from the cylindrical glass tower at its new retail store in the Pudong district of Shanghai. Like the company's flagship store on Fifth Avenue in Manhattan, the Pudong store is located below ground level and utilizes the glass tower as an iconic entryway with a glass stairway descending to the store below. 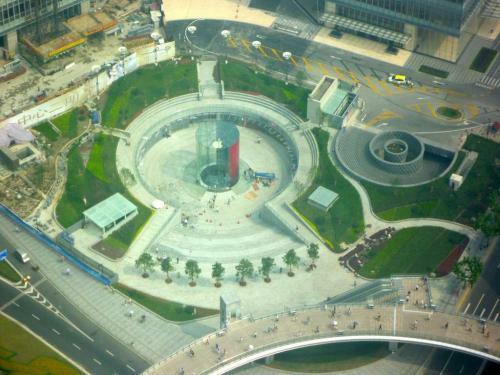 Flickr user Lesh51 has posted several photos from the site, including an interesting aerial view showing the glass tower rising out of a central plaza at the International Finance Center. The Pudong store is set to open this Saturday at 10:00 AM.